I mentioned in a previous post that I was having complications from my recent surgery to remove my parotid gland. The problem was that I am still generating new saliva which is causing some pain when it fills up too much and because it doesn’t drain into my mouth, but instead my neck. I have an update on the issue. It doesn’t seem to be getting too big and I can feel it drain on its own without me having to push on it to milk it, for the lack of a better word. How it does it is very strange, it feels like sweat is running down my face along the scar along my ear. Although I am not positive that that is what it is, that could just be my scar tingling as it has been doing. I am feeling it right now as I type this because I just ate a bowl of cereal which generated some saliva in the gland. I actually don’t know where the saliva would drain from that gland. When I have pushed on it before, I feel a vein bulge inside of my mouth which is near where the parotid gland used to be in front of my earlobe, so it is possible that there is a vein, or tube or whatever you want to call it that allows the saliva to travel to reach its destination to release somewhere. Perhaps that was releasing into my parotid gland which would release into my mouth, or perhaps it had a tube in common with the parotid gland, which is now gone since the parotid gland is gone. So I don’t think that I have much to worry about. It seems to be correcting itself, despite how freaking strange it feels lol. When I look into a mirror I don’t even notice it much anymore. I mean, I see a little lump, but it looks normal considering there is still a hole beside it. The hole isn’t even that noticeable anymore. I mean, when I look at it in the mirror with a shadow on it, it’s very noticeable, but I just took a picture using the flash and you can barely see it. 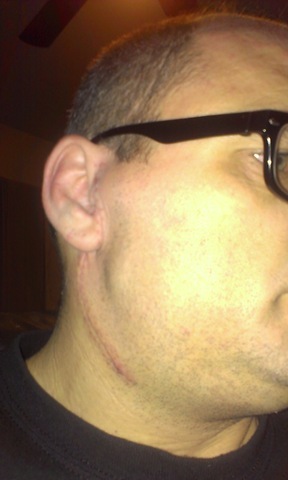 All you can really see is the scar, which seems to stand out along my neck. When I touch it with my fingers I can still feel a hole, but it does seem to be filling in. When you look at the image to the left you can definitely see where the saliva is filling up in the saliva gland which has no exit into my mouth, but instead in my neck. It’s that little marble sized ball. I will definitely be speaking to my doctor about what is happening because he told me that there was a collection of “spit” (his words) that has collected and it will be absorbed into my body, but it’s nothing to worry about. The very fact that it is still collecting, or generating new “spit” that is draining into my neck seems like it should be something that I should worry about, but I am sure it is hardly a problem considering if it were draining into my mouth, I would end up swallowing it, so it ends up being absorbed into my body regardless of how or where it drains, so again, I don’t see that much of a problem. So that seems to be it for now. My appointment with the surgeon isn’t until March, but my next appointment with my regular doctor is in January. I will mention it to both doctors and if it is an issue then I will post another update, otherwise I don’t see much of a reason to add another update on this because it doesn’t seem to be causing as much of a problem. I had a parotid tumor surgery April 2, 2019. My tube was removed April 9th. Today is April 14th. I have still have huge…hard lump in front of my ear and am wondering if this is normal 12 days post-op? How long was your lump in front of your ear. Ok, in front of my ear around the middle to below the ear lobe is like a huge scoop has been taken out of my face. Above that is just bone I guess. I can feel like I guess what seems to be my cheek bone going all the way to the front of the top of my ear. I didn’t have a lump though after surgery, what I had after surgery is what I have now. Did they remove the entire parotid gland, or did they just remove the stone? They told me they couldn’t just remove the stone, that they had to remove the entire gland. Are you on Twitter? I’m @xanapus on Twitter.